Where Have All The Good Malls Gone? My first job was at the mall, selling baked goods and frozen yogurt to assorted mall rats. Amidst the aromas of chocolate chip and oatmeal raisin, I traded cookies for records with the rad Wherehouse Music dudes and fended off advances from the gross Florsheim shoe sellers. I received awesome advice from the silver-haired manager of See’s Candies. She used to bring me mint truffles and Bordeaux chocolates. It was totally cool. This is when it was actually called “The Mall” — not the “Fashion Center” or “Place” or “Square.” When the Mall of America was assembled like a Smithsonian Institution of shopping no other establishment seemed to be allowed to use that moniker. Instead another breed of mall has arisen — the ambiance more carnival than commercial. Kiosks are the new tents where hucksters promote their magic potions and gadgetry. Hair extensions, convertible purses, and cell phone cases blanket the marketplace. Pretzels, popcorn, and corn dogs fill the food court with county fair atmosphere. Bungee jumping outside one entrance. 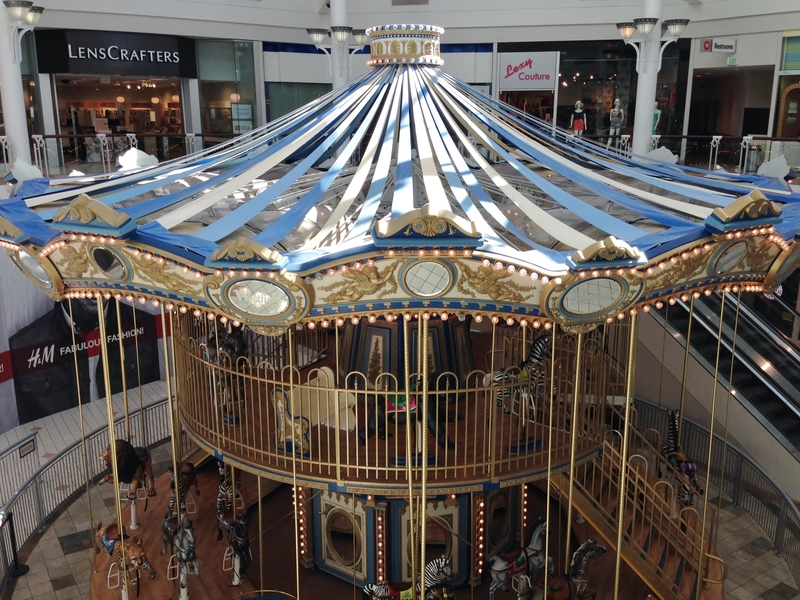 Two-story carousel at the other. I try to avoid it as much as possible, but the day came when I couldn’t any longer. I needed a new purse. After discovering that my desired purchase — a black leather evening bag — was an excluded item on my Macy’s coupon (along with most of the store’s desired inventory); I made the foolhardy decision to enter the main drag. My plan of attack for the midway was derived from battle skills developed after years of cruising Los Angeles freeways. Change lanes often and COMMIT. Any hesitation is opportunity lost and ten minutes added to your commute. Speed whenever you are able. Sig Alerts happen randomly and often. Cover as much ground as you can before you need to slam on the brakes. EYE CONTACT IS A SIGN OF WEAKNESS. I stepped into the bazaar and the ballyhoo began. He made eye contact. I was hooked. The mastermind was indeed inspired — I was mesmerized. “Who? Me? No. This old thing? Why thank you!” Unbelievable! I let him guide me to his salon chair and begin his spiel. “Your complexion needs nothing! But your under-eye area could use some rejuvenation. Let me show you our cosmeceuticals.” He daubed his petroleum-jelly potion on my saddle-bag eyelids. I hoped he’d ignore my botched eyebrows. I had them “shaped” a few days before. The brow expert had taken cuticle scissors and snipped a notch in the middle of each brow to create more “personality.” I looked like the surprise emoji. “Beautiful! Let me show you the difference!” He tore off a bit of toilet paper and adhered it to my tacky eye. “See how refreshed it looks!” Stunned by the use of this product at the complete opposite end of its conventional target, I no longer had any idea what he was trying to communicate. I half expected Rosanne Rosannadanna to call me out. He waved his glossy brochure in front of my tissued face and explained their current promotion. Ordinarily the price of a month’s groceries, but — for today only — the cost of an exorbitant dinner. The dollar signs snapped me out of my Svengali state and I bolted for the nearest lane. Merge complete, I proceeded. Gaining speed, I dashed past the radio-controlled cars, veered away from the knock-off cologne atomizers, and … alert, alert, stroller ahead! Mall gridlock. The closest carny barker seized the opportunity. “Charming lady, I see you are tired. Here, sit a moment and let me dee-mon-strate the wonders of our Dead Sea min-er-al products.” Repossessed, I obliged. This time it wasn’t the slick snake charmer pitching, but his lovely assistant. She grasped my wrist and deftly twisted. I was ensnared in the sideshow version of a headlock. Their products are designed to remove all impurities, she explained as her clutch tightened. Now convinced that the under wrist is a bastion of epidermal pollution, I was enthralled. She applied her mineral speckled cream in a circular motion; the illusion began. “See how all your contaminants are extracted?” She asked as small, charcoal grey globules began to appear. “Imagine how it could detoxify your face.” I used to rub Elmer’s glue in my hands as a child and achieve the same results. Apparently, I was way ahead of my time in the cosmeceuticals game. I snapped out of my spell and began looking for the nearest on-ramp back into traffic. Sensing this, the manager reappeared and began his play to save the sale, a.k.a. the Sympathy Song and Dance. “I know you are struggling,” he cooed. (My bedazzled fleece had migrated from Parisian runway to thrift store, it seemed.) “Let me give you my employee discount.” The lovely assistant finally released her kung-fu grip, presumably so I could take advantage of his magnanimous offer, and I seized my opportunity. Once back into the flow, I covered my greased eye with my glue-cleansed wrist, certain they were both beacons flashing “Sucker!” to every dealer on this side of the midway. I told myself I was striking a starlet hiding-from-paparazzi pose, but in reality I looked like an accused felon leaving the courthouse. My peripheral vision hindered, I reeled through the midway like someone who spent way too much time in the beer garden. Abandoning all hope of finding a purse, I caught the calliope melody of the monster carousel and let the tune guide my wobbly progression. The stagger I had acquired soon developed into a pronounced lurch. Traffic parted for me as I appeared to be a carrier of some long-lost contagion. My emoji eyebrows only heightened the perception. Unclean! Unclean! The warning was silently transmitted to all patrons in my path. I reached a bench and slumped down, narrowly missing a toddler gnawing on his pretzel bites. Staring at the Gap Kids-clad child, I pondered what will be his shopping community. Will it be valley, or carny, or some new society? Perhaps it will be a hub of vending machines devoid of all human contact. A wave of chocolate-chip nostalgia descended and then it hit me — the food court was on the opposite end.